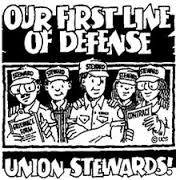 *Rights of Union Members and the Local Union Steward, such as "Weingarten Rights", Duty of Fair *Representation, Information Requests, etc. *Source of the "Union's" Strength and Power *What constitutes a Grievance? Past Practice? Click HERE for a printable flyer that you can post on the Local union bulletin board or email to your membership. If you are interested in attending, please email Lila Beaulieu or contact her via phone at (207) 620-3907 no later than March 25th, 2016.